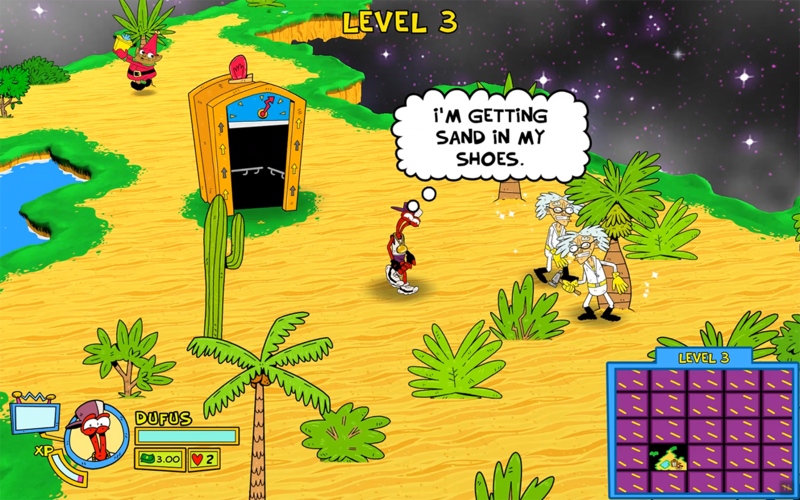 ToeJam and Earl are a near-perfect reflection of the culture of the early 1990’s. That awkward transition from the 80’s was assisted by the growing popularity of hip hop music. Of course grunge was also popular during that time, but I couldn’t imagine playing ToeJam and Earl as a couple of grunge fans. It would have totally killed the sweet funky vibe of my favorite video game alien duo. 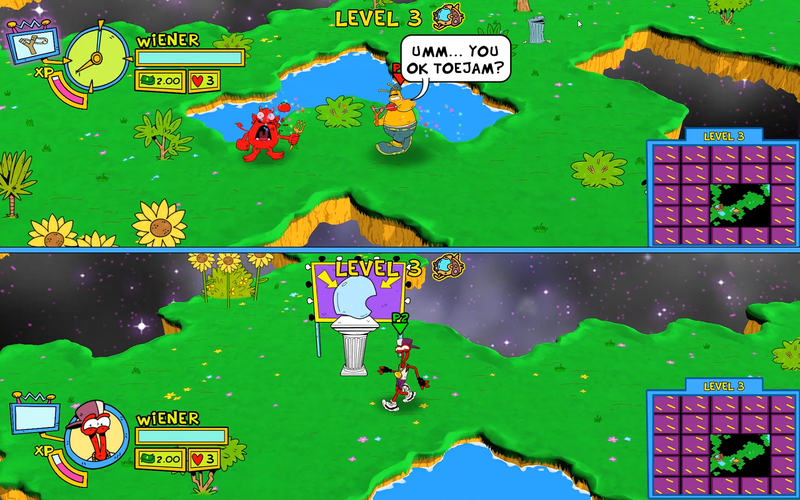 Here we are in 2019, almost 30 years after the original ToeJam & Earl was released for the Sega Genesis, with the release of ToeJam & Earl: Back in the Groove. The new release from HumaNature Studios plays a lot like the old 1991 version, which is a combination of roguelike dungeon crawling mixed with RPG elements and lots of minigames. Your main objective is to collect pieces of your (or should I say, Lamont’s) spaceship after accidentally creating a black hole and getting sucked into it along with planet Earth. Players traverse various levels of broken Earth to find the spaceship parts, collecting presents and avoiding Earthlings along the way. The core gameplay mechanic is definitely different. Presents are items that you can use to advance through each level, whether it helps to avoid taking damage from an antagonistic Earthling or helping to warp you to a location closer to the spaceship part. You’ll have a set inventory of how many of these presents you can carry, but that can increase as you get promoted (ie, level up). It’s also helpful to identify what’s actually in the present before using it through the aid of the Wiseman. Nothing is worse than burning through a helpful item at the wrong time. Levels not only contain Earthlings and presents, but also minigames like dance competitions and running through the Hyper Funk Zone, an element introduced in ToeJam & Earl in Panic on Funkotron (one of my favorites of the Genesis era). Completing minigames can win you presents or money (Money!) to further help you in your quest. You’ll also earn XP to level up your character’s stats, like speed, health, and inventory size. There are 6 playable characters to start (with 3 more to unlock) and each character has different strengths and weaknesses. Not only can you play as TJ and Earl, but you can play as their classic versions or as entirely new characters to the series. All of this sounds pretty crazy, right? Luckily, for those who are unfamiliar with ToeJam & Earl gameplay, there is a somewhat handy tutorial playthrough that can help guide new players. The game has multiplayer co-op with up to 4 players, but I wasn’t able to try it out. Graphically, the game is bright and colorful, with 2D characters and objects rendered on a 3D world. There are lots of jokes and humorous Earthlings to encounter. The music is awesomely funky and includes some of the tastiest basslines by “funkmeister” Cody Wright. Click through to open up the soundtrack on Spotify and get ready to groove. There are also some hilarious sound effects that will help make your time in ToeJam & Earl: Back in the Groove even more enjoyable. What I didn’t enjoy about the game were the controls, specifically within the environments. Too many times did I push the action button only for TJ or Earl to not interact with the object that was nearly right next to them. Also, some of the buttons are mapped to multiple actions, meaning that you likely survey something after you failed to interact with an object. There are plenty of instances where the game does correct for this through animations, but it still can remain a nuisance. I’m sure it’s circumstantial when having 2D elements interacting on a 3D environment. 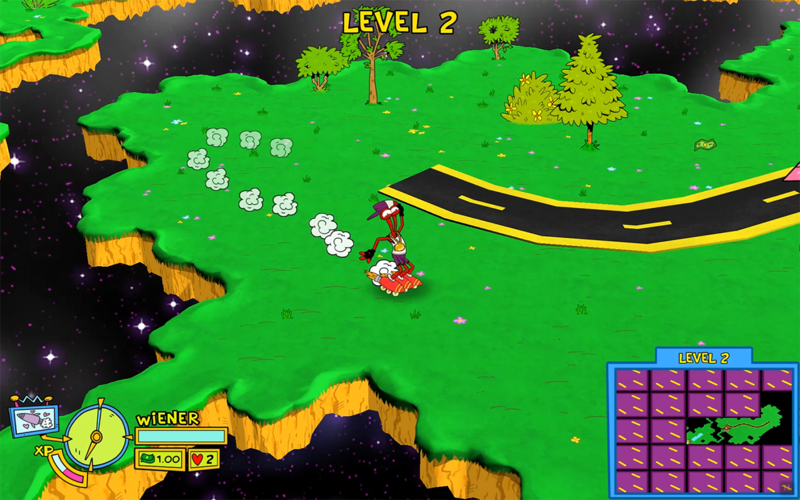 All in all, I really enjoyed my trip through space with ToeJam & Earl: Back in the Groove. It’s unique gameplay, characters, and style offer up a good time, but I understand if the nostalgia trip might be lost on some who didn’t grow up playing TJ and Earl games. But if you did and you are curious what these two are up to now, I definitely recommend checking this out on the Switch.